Ramón jingled the coins in his pocket as he finished selling his chickens’ eggs at the village market. He thought about the jar at home that held his tithing coins. On Sunday he was going to give the coins to the bishop. Ramón had a warm feeling inside. He was glad to pay tithing. The market stalls were full of things for sale. Ramón saw a colorful shirt with the logo of his favorite football team. He pictured himself wearing the shirt, running down the field, and scoring the winning goal. Ramón looked at the price tag. He could buy the shirt if he spent all his egg money plus his tithing coins. Ramón noticed the warm feeling was gone. He really wanted the shirt, but he knew Heavenly Father wouldn’t want him to spend his tithing coins. Ramón started walking home. He decided to pay his tithing first. Then he could earn more money selling eggs until he could buy the shirt and pay his tithing like the Lord wanted him to. When we pay our tithing, we fill out a tithing slip. We put the money and the slip in an envelope and give it to a member of the bishopric or branch presidency. 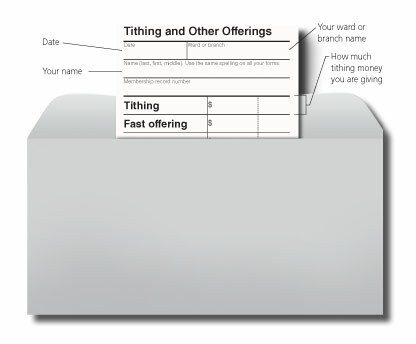 You can learn how to fill out your own tithing slip by looking at the picture below. Besides entering your tithing, what else can you fill out on the tithing slip? Ask a parent about other ways you can donate to the Church. Malachi was an Old Testament prophet who taught that when we pay tithing, the windows of heaven will be opened and blessings will pour down upon us (see Malachi 3:10). As a family, talk about what blessings you have received from following the law of tithing. 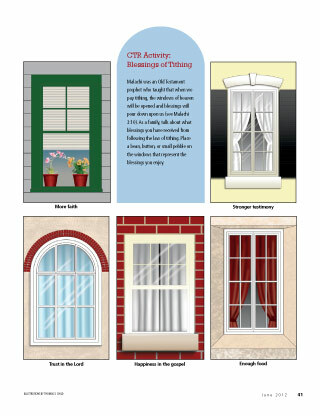 Place a bean, button, or small pebble on the windows that represent the blessings you enjoy.